DAYTONA BEACH, Fla. – Corvette Racing returned to Victory Lane for the Rolex 24 At Daytona on Sunday, scoring a hard-earned GT Le Mans class victory in the opening race of the 2015 TUDOR United SportsCar Championship. Antonio Garcia, Jan Magnussen and Ryan Briscoe won in their No. 3 Chevrolet Corvette C7.R in Corvette Racing’s second race back at Daytona since 2001. Garcia crossed the finish line by 0.478 seconds. The winning trio completed 725 laps – 2,581 miles – for the team’s second Rolex 24 victory. 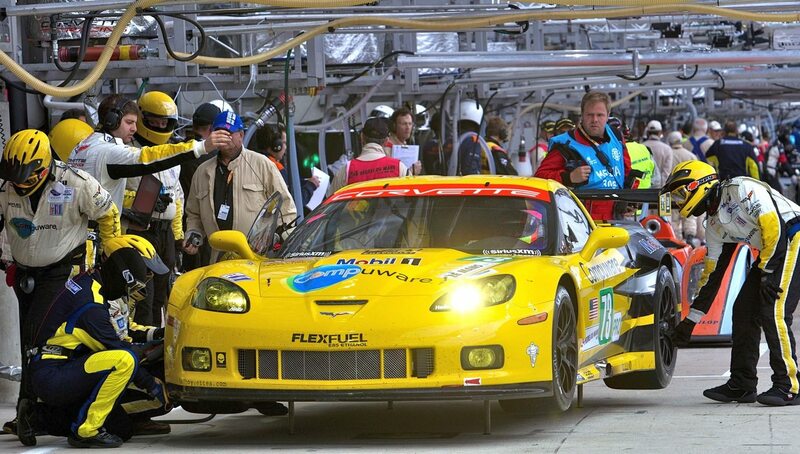 Corvette Racing captured and Rolex 24 overall win 14 years ago but didn’t race at Daytona again until last season in the first race for the TUDOR Championship as well as the Corvette C7.R. GTLM pole-sitter Oliver Gavin, Tommy Milner and Simon Pagenaud placed third in class following a strong run. 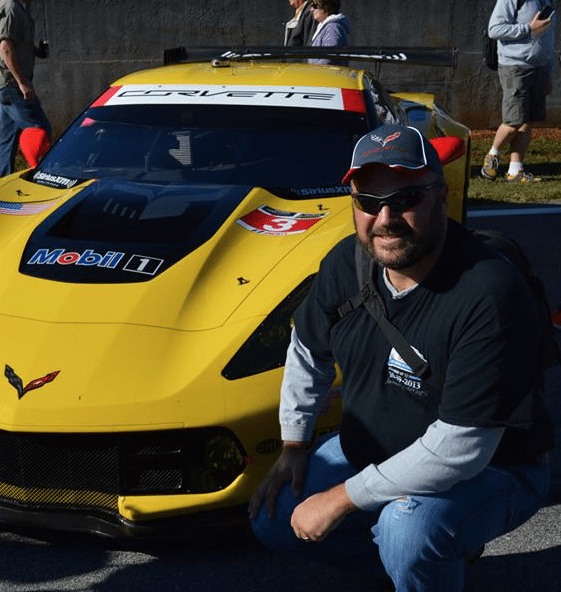 Jim Campbell, U.S. Vice President Performance Vehicles and Motorsports added: “To have both of the Corvette C7.R teams on the GTLM podium for the Rolex 24 Hour is a testament to the Never Give Up attitude of the crew and drivers. Oliver Gavin, Tommy Milner and Simon Pagenaud continually battled back from adversity to get a podium finish. 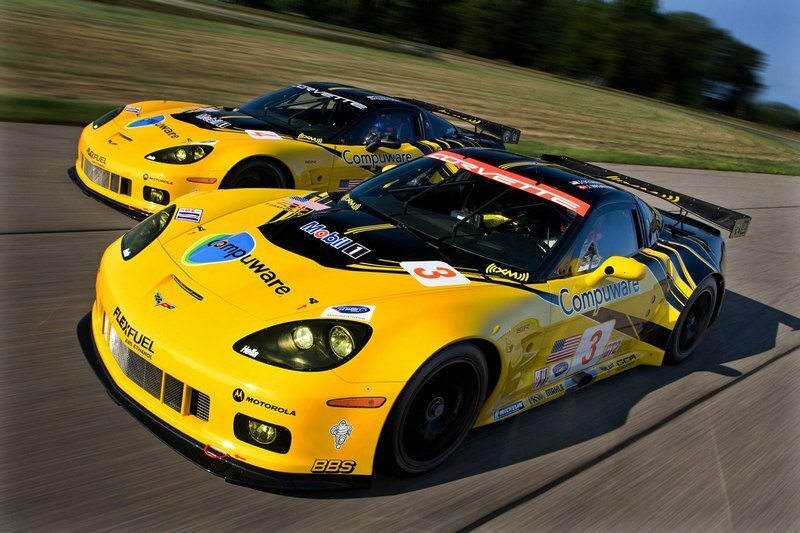 The two Corvette C7.Rs were the class of the field throughout the race. For much of it, the GTLM fight resembled a 24-hour sprint race. The rate attrition was extremely high with nearly every car in the class experiencing at least a moderate amount of damage or mechanical trouble. 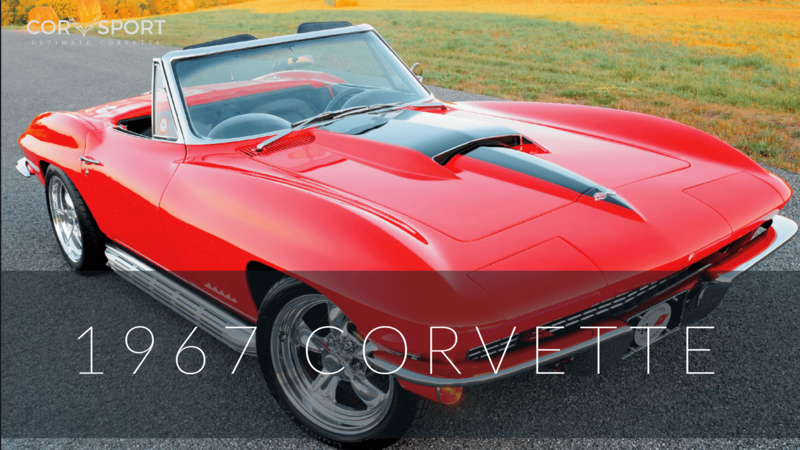 The only one that stayed out of significant trouble was the class-winning Corvette. The Garcia-Magnussen-Briscoe trio led more than 360 GTLM laps and took the lead for good with 90 minutes left when the then-class leader experienced trouble in the pitlane. The No. 3 Corvette responded shortly thereafter with a perfect stop for tires and fuel to increase its lead. Garcia – as he, Magnussen and Briscoe had been throughout – was precise and clean in the final run to the checkered flag. Gavin, Milner and Pagenaud were the equals to their teammates three-quarters through the race. Despite two unscheduled stops to repair slight damage, the No. 4 Corvette ran with its sister car until Milner came upon a slow prototype car that nearly came to a stop just before the Turn 6 complex just three hours from the end. The crew of the No. 4 Corvette had to repair front and front-side components and lost four laps in the meantime. 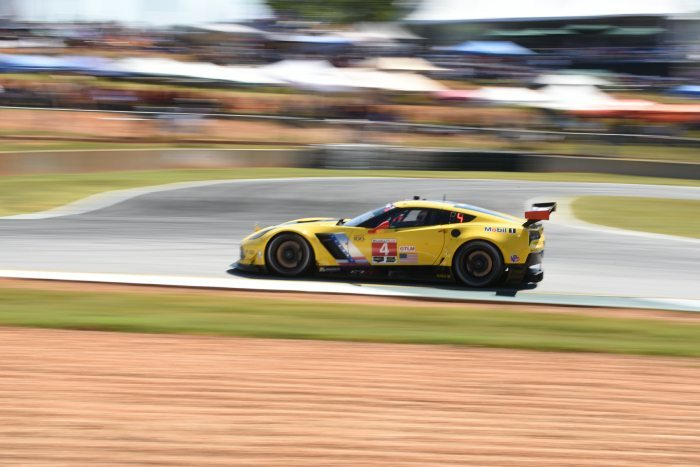 Nevertheless, the result was enough to send both Corvette C7.Rs to the TUDOR Championship podium for the first time since last April’s Long Beach round. Two Corvette Daytona Prototypes filled the TUDOR Championship’s Prototype podium at Daytona on Sunday. Action Express Racing’s No. 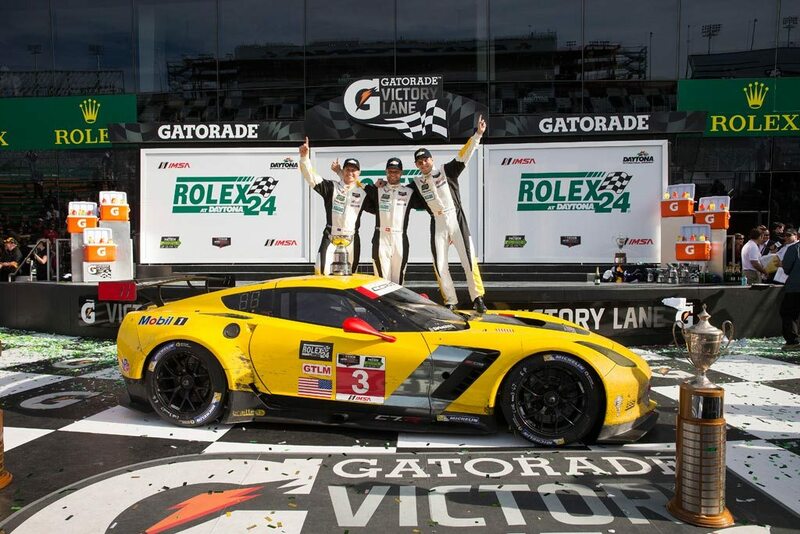 5 Corvette DP of 2014 Rolex 24 winners Joao Barbosa, Christian Fittipaldi and Sebastien Bourdais placed second – just 1.333 seconds from a repeat victory. Wayne Taylor Racing’s trio of Jordan Taylor, Ricky Taylor and Max Angelelli placed third in their No. 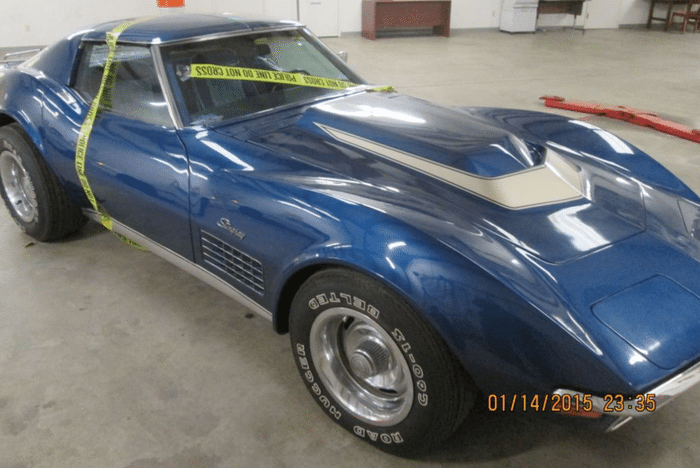 10 Corvette DP. 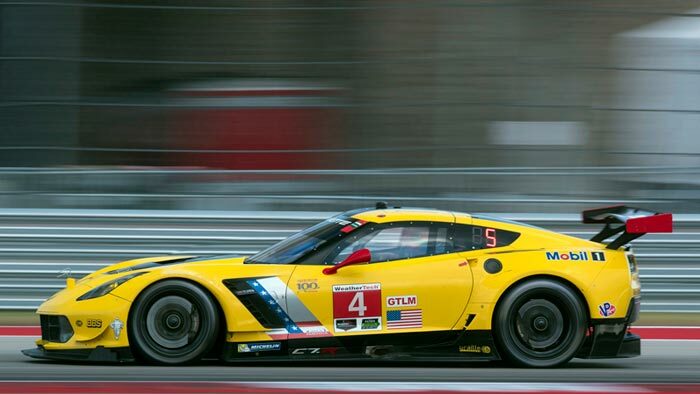 It marked the second straight season that multiple Corvette DPs placed in the Rolex 24 top-three. The race featured 59 lead changes, and three Corvette DPs – Action Express Racing, Wayne Taylor Racing and VisitFlorida.com Racing – each led during the event. 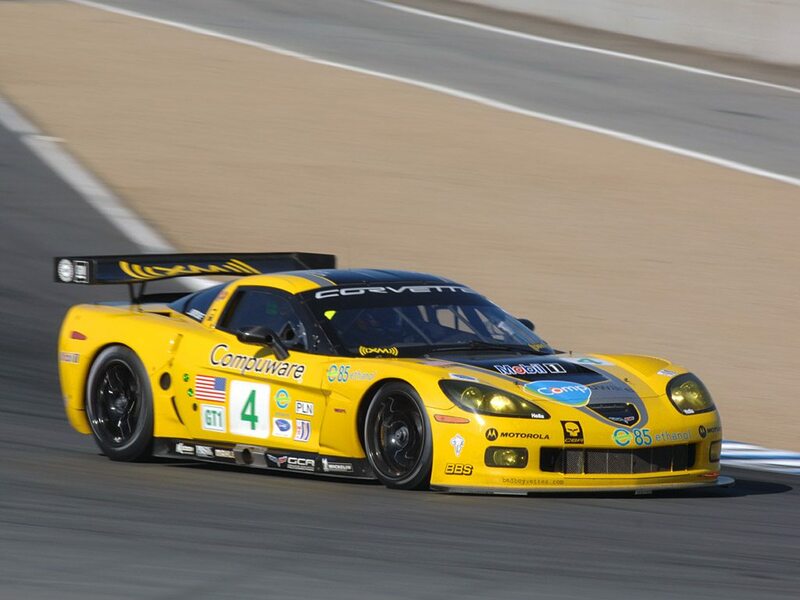 The race was the first for the C7-styled Corvette DP with all four finishing in the race’s top-seven. The 2015 TUDOR United Sports Car Championship continues with the Mobil 1 Twelve Hours of Sebring presented by Fresh from Florida on Saturday, March 21. NATE SIEBENS: Let’s slide over to the GT Le Mans winners. Let’s start with the trio from the No. 3 Corvette Racing Chevrolet Corvette C7.R. It’s the team’s second Rolex 24 at Daytona win, first since taking an overall victory in 2001. It’s also Antonio Garcia’s second Rolex 24 win where Jan Magnussen and Ryan Briscoe, for both this is their first win. Ryan, let’s start with you. How does that new Rolex feel? RYAN BRISCOE: It’s beautiful. I’ve been coming here since 2005, so yeah; I wasn’t a big fan of this place until now. It’s just such a tough race. Jan and I were talking about it before we came in, for both of us it’s the first time we’ve ever done the race without going back to the garage. I think that was a huge part of us winning today was staying out of trouble. There’s so much action all race long. I felt like it was a sprint race out there from the word go, in our class at least, and the racing was very good but very tough, a lot of fun, but very hard-fought. I think the key was keeping our nose clean, having a fast race car at the end of the day. NATE SIEBENS: Antonio, obviously you know what it feels like to stand atop the podium here at Daytona. You did it in 2009 with Brumos Racing in an overall victory. Any difference here today with this group? ANTONIO GARCIA: Not really. Every time you win here it’s very, very special. I’ve been chasing this victory since 2009, even if I won it back then. This is a very unique race. The first race of the year, so it’s very difficult to be at 100 percent right away for the team, for the drivers, and it was just a normal perfect race — not normal I have to say. Everything ran perfect, and as Ryan said, we just kept our nose clean, and I had the best car to fight on the last eight minutes of the race. NATE SIEBENS: Jan, you’ve had other big wins obviously in your career, but maybe put into perspective getting this one here for the first time. JAN MAGNUSSEN: Well, it was a hard one for me to win. I’ve tried 11 times. I’ve always felt that I was within a shot of winning the race, but we always had to go back to the garage sometime to fix something, and that was the big thing this weekend was that we had a really, really fast race car, and we were able to push hard. We stayed out of trouble, no mistakes; no damage to the car, good pit stops, great pit stops, and that was the key to winning this race. Q. Early in the morning I think you and some other GTLM teams drove nearly identical lap times with the prototype cars. Do you think this new United SportsCar Championship and GRAND-AM together, we can see or expect in maybe one of the next races a GTLM car taking the overall win? JAN MAGNUSSEN: I doubt that. This place is pretty unique. We have really long straights in the GT cars. The GT cars have quite good top speed, so that counts for us. I don’t know that the tracks that we’re going to that we will have a situation where a GT car can win overall, but that really depends on if they go completely berserk in the P class. Maybe. NATE SIEBENS: Can you talk about the level of competition in your class? Seems like top to bottom every team and every driver lineup is really, really strong. ANTONIO GARCIA: That’s the good thing about this race. It’s the first race of the season, and you have drivers coming from many other series. You have every single manufacturer has their best drivers coming here, and we show that, BMW, Porsche, Aston Martin, Ferrari. You couldn’t see a better lineup overall for all the manufacturers here. And I think we show that. Since lap 1 all the way to the last lap, we showed that GTLM is very competitive and teams are extremely competitive, too, and you can’t afford to do any single mistake. Very proud that I was in the right car, and we just did what we had to do, drive a perfect car. NATE SIEBENS: Gentlemen, congratulations. 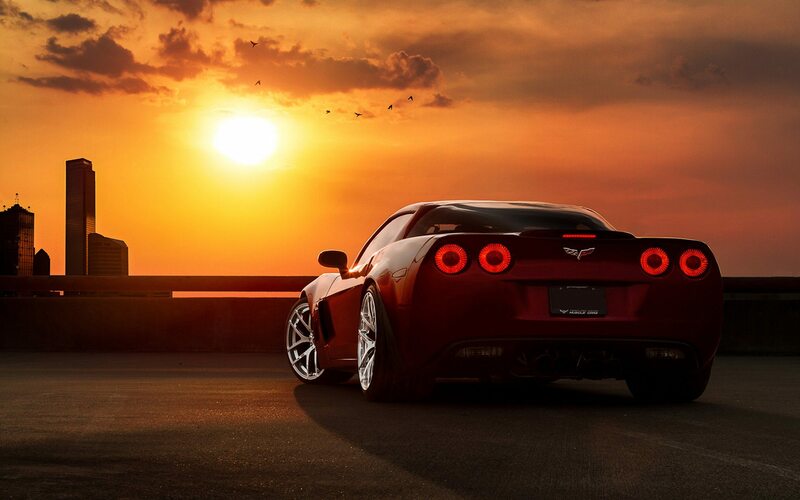 Thank you very much for joining us, and we’ll see you all at Sebring. NATE SIEBENS: We’re joined by our second- and third-place finishers in the Prototype category. Start with our second-place finishers today, defending race champions, the No. 5 Mustang Sampling Corvette DP. Christian, obviously you guys also won the TUDOR United SportsCar Championship Prototype title last year. Another strong start, but one position shy I guess this time. Your thoughts? CHRISTIAN FITTIPALDI: Well, pretty much what you said, one position shy, but at the same time, we’ll take it because I think that from the get-go we never had a perfect car, and we were struggling with the car during the whole race. We tried to make a couple of changes, but it got better, then it got worse, then it got better, but it didn’t go completely our way, so we’ll definitely take the points, and they are going to be very important for the championship, especially when it comes down to the last race of the year. You need the extra points, so maybe it’s going to play in our favor. But very thankful to Chevy, Action Express, Mustang Sampling, they definitely put a whole huge effort behind the program. I’ll tell you, this race is a lot of effort because you’re pretty much preparing yourself the whole year for it, and everyone that’s here obviously wants to win. We didn’t today. Congratulations to the Ganassi boys. They had a perfect run, and let’s move on to the next one. Thanks. NATE SIEBENS: Joao, talk a little bit about obviously you guys really had to battle back from I think about three laps down. Talk about maybe what put you down and what it took just to get back to a position where you could battle for a potential victory here. JOAO BARBOSA: Yeah, I mean, I think it goes down to all the preparation the team has done in the last couple of years. Unfortunately we had a problem with the fuel pressure that made me stop on track, but the team was prepared right away. I mean, I think I lost probably like 10 seconds to fix the problem when I got to the garages and got back out there, so we lost three laps. It wasn’t looking very good. We were three laps down for a long, long time, and we were kind of losing hope, but I think the team did an excellent strategy. The guys worked really well in the pit stand and did perfect strategy. I think we got two laps in one time, so put us back in contention. We were able to lead quite a few laps after that, after we were on the lead lap, and overall we were pleased with our result. If we can’t win, then second is the second-best thing. It’s very important for the points in the future. The team has to be proud with what they have and where we come from. Three laps down is never easy to come back in such a strong field, but you know, we’re pretty pleased with second place. NATE SIEBENS: Sebastien, can you maybe share your thoughts of a pretty eventful, especially the eventful final 20 minutes or so of this race or 15 minutes of this race, during that period of time? SEBASTIEN BOURDAIS: Yeah, I guess for us, really when the sun got up, it started to get hotter and hotter, and we kind of — we were halfway there when the night was there, and it got really cold, and the grip was a little better for us, and we could challenge a little bit, but when we were lacking grip, and that’s been the story of the week and even at the Roar. Really, there wasn’t much going on. I was kind of in for the last four stints and just did the best I could, but I wasn’t too hopeful that I could give a shot to the 10 or the 02 because they were just plain quicker. I guess we just are really happy. There were mistakes made at the end, and you can always hope that something is going to happen and maybe you’re going to end up in the lead, but you can’t be that lucky sometimes. It’s kind of a surprise that we got second from the 10, because really that means that we cannot win the race for the points because the 02 is not a championship car. It’s a pretty good day for the team, and I’m just glad I could participate with the effort, and it’s always great to race with these guys. Let’s move over to our third-place finishers before we open it up for questions. We’ll start with Max Angelelli. This is your team’s third consecutive podium result here at the Rolex 24. Obviously you were hoping to get a victory here on the 10-year anniversary, I guess, of the one that you got in 2005. Share your thoughts if you would, please. MAX ANGELELLI: Well, first of all, I’m happy to be here, in the top three finishing especially, because Friday we thought we couldn’t make the race. We had so many problems, electrical problems, and our guys, our team worked all night, and they solved the problem. They gave us an ultra-competitive car Saturday and Sunday, hot and cold, and it’s been good. We were competitive, all three of us, and we fought like lions, and we are looking forward for the next challenge, the next race. NATE SIEBENS: Jordan, I think everybody probably would like to know what took place there the last driver change, what precipitated that. JORDAN TAYLOR: Well, I haven’t spoken to everyone, but I just know that you can’t drive four hours in a six-hour period, and I think we were creeping up on that. It was just a small miscalculation, I think, an unfortunate one because we were right where we kind of wanted to be, second place on the restart. I think we had a stronger car on restarts on cold tires, so it was a perfect opportunity to make something happen, but I mean, it’s hard for us as drivers to complain too much because our part of this race is very minor compared to what they have to do. We’ve gone 72 hours now without going to the garage once, without losing a lap, so that’s a testament to our team. We never have anything bad to say about them. NATE SIEBENS: Ricky, I’m sure you weren’t expecting to be getting back in the car there, especially with so few laps and so few minutes to go. How long does it take you to get yourself geared up to jump back in there like that? RICKY TAYLOR: Yeah, I was not happy to be back in the car. The plan was always, we knew it was going to come down to making a little bit of fuel, and Jordan is the best out of the three of us at doing that. He’s always been good at fuel mileage and maintaining a pace while saving fuel, so our engineer told me when I got out of the car this morning, I was probably done because I’m not so good on saving, and then the way it kind of fell down at the end was just a matter of — they knew what they were planning, they knew the rule, it was just when Max had to get out of the car, the way the circumstance went, they were thinking of so many other things. There were just so many factors that went into it. I wasn’t happy to get back in the car after Jordan there. Q. Ricky and Jordan, I know it might be hard to kind of put everything together emotionally, but can you talk about the disappointment this year on top of what happened last year, which was also something kind of freaky and just how it just seems you guys are snake bit here? RICKY TAYLOR: Well, this one is much harder than last year. We haven’t had TC or the electronics working the entire weekend, and the guys had less than five hours of sleep the entire weekend, just working on the TC and working on getting all of our electronics working. Then we started the race, and it was all still not working and the engine was cutting out. We were having all sorts of electrical issues, and I thought, you know, we might not finish. We might never solve this issue if we couldn’t solve it all weekend. But the guys did an incredible job. It was kind of an accumulation of all the things that they tried throughout the weekend, and then they finally nailed it on the first stop of the race and gave us an absolutely incredible car. It’s just a shame that after all that effort we weren’t able to produce a result for them. Q. Do you have anything to add to that? JORDAN TAYLOR: Not really. Last year I think the 5 car had us on pace, and we were kind of where we thought we would be. This year I thought we were really strong. The 02 was obviously strong, but if we had track position I felt like we could have raced them this year. I think having that last restart opportunity was like a golden ticket, and we haven’t had that the past three years. Q. I was wondering if you could kind of take us through how you schedule out driver changes. Is it decided beforehand, kind of a rough schedule, and then you make tweaks based off of how the race is going, or is it all kind of by the seat of your pants? MAX ANGELELLI: We schedule before and then we tweak based on the type of racing that we’re facing. If it’s a fuel-based finishing, then we have Jordan, which is the best on that. It depends also on the weather, the car condition, and many things. But it’s prearranged with little tweaks. JORDAN TAYLOR: I don’t know, you look at these races, and it’s crazy. I mean, you look at our car, we’ve got a couple scratches on it, and the stuff that, I mean, all these guys can say what a nightmare it is out there sometimes with some of the traffic. To have these two guys, like all three of us, I think we trust each other so much; we’ve been together for so long, even before Ricky and I were driving. To have that trust in a team, often during a 24-hour the scariest part is going to sleep not knowing if you’re going to wake up and your car is still going to be on the board. So I know having them with me, you can always go to sleep with positive thought. Q. Max and Ricky, what was it like in the pits when somebody had to fess up and say, I’ve screwed up, we didn’t count all the hours for Jordan? What was it like in the pits there when that happened? RICKY TAYLOR: Nobody made a mistake. It was just they had calculated it, and just the way that we’d planned it for hours and hours and they knew exactly what we were planning to do, and it was just at that time the way the fuel stint had worked, it was such a close call, and we were thinking about — we were just so busy thinking about the last tire stop, what we were going to do with tires, two tires or no tires or what. It was nobody’s fault. Q. How close were you, how many minutes? RICKY TAYLOR: I don’t know. I think it was like five or ten minutes or something. MAX ANGELELLI: By a little. Q. Following up on that, Jordan, what was your reaction when they told you specifically you had to get out of the car, because that was not the plan and you looked like you were a little confused maybe? JORDAN TAYLOR: Yeah, well, obviously when you’re about to restart with 10 minutes to go you’re not expecting to get out of the car. I figured I kind of had an idea about what it could have been. There’s no other reason for that to happen. One thing crossed my mind was maybe they made a change to throw my dad in there to finish off the race, but I had a pretty good idea. Q. Jordan, I think around 9:00 or 10:00 in the morning you had a little incident with the Action Express car on pit road. Can you give some more explanation? Did you not see the car? JORDAN TAYLOR: I saw him because I was passing him. He braked a little earlier than me so I went to the inside, and I spoke to Beaux Barfield yesterday morning about if someone is a little slower on the pit entry if you’re allowed to pass, and he said in his eyes that’s the racetrack until you get to that line. We were so early on our pit lane, he said it wasn’t necessary for us to be in the high-speed lane so I entered the pit next to the 5 and I got a tap on the right rear. I didn’t think I did anything wrong.